You are a secret agent working for the British in Berlin. You are due to go home on leave, but you are being followed-by your own people, or by the enemy. A man meets you in the theater and briefs you on a plot to revive the power of Nazi Germany. You do not believe him, but you remember that one of the suspects mentioned was a senior SS officer you met with in the days when you were working as a spy in Nazi Germany. The next day you make contact with a beautiful girl who may know something. Someone tries to kill both of you. Your name is Quiller. You are the hero of an extraordinary novel which shows how a spy works, how messages are coded and decoded, how contacts are made, how a man reacts under the influence of truth drugs-and which traces the story of a vastly complex, entertaining, convincing, and sinister plot. Using the penname Adam Hall, British author Trevor Dudley Smith (better known as Elleston Trevor) wrote 18 popular novels chronicling the exploits of his spy, Quiller. 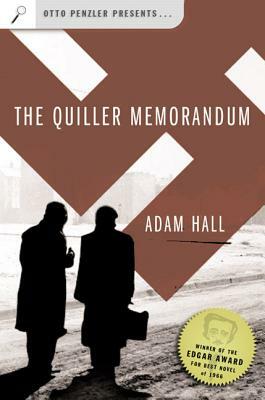 The Quiller Memorandum earned him an Edgar Award from the Mystery Writers of America. Several of his books have made it to the big or small screen, including Flight of the Phoenix (filmed in 1965), Quiller (The Series), and the made-for-TV movie The Penthouse.